In a city located right by the Baltic Sea, one would expect a lively fish market showcasing the catch of the day, but it’s one area in which Stockholm is surprisingly and sorley lacking. When markets have been organized, like last spring on Stureplan, hundreds of people have been lining up to buy fresh fish, and finally someone seems to have taken the hint. The good people behind restaurant Sturehof have banded together with Stockholms Fiskmarknad, and they are finally setting up a semi-permanent market. From Tuesday through Saturday, December until April, fresh fish will be sold outside the restaurant on Stureplan. Most of it will have been caught in the Stockholm region, but when there’s enough supply, even shellfish from the west coast will be available. At the same time, the city of Stockholm is working on a plan for a larger fish market with its own building, and the search is on for an entrepreneur who would be willing to run it. The idea is to start using our waters and the fish in them in a more efficient and environmentally sound way. For a long time, the fishermen in the region have had trouble selling their catch for a price that would cover the cost of hauling it in, and a direct link between the capital’s fishermen and the consumers has been missing. Many times, pike and perch from Mälaren or cod from the archipelago need to travel to Gothenburg in the back of a truck to be sold at an auction. Then it’s back to Stockholm, to a local supermarket, and finally on to our plates. By that time, the fish can be up to a week old. Stockholm’s new fish market should put an end to all that – at least until April. 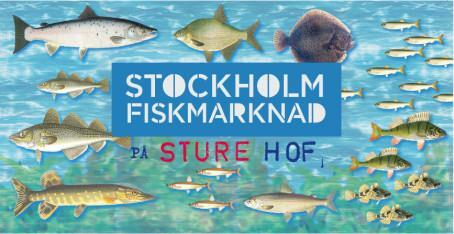 Stockholm’s Fish Market, open Tuesday-Friday 10-18 and Saturday 11-17.